Fall Backdrops, Backgrounds & Props A chill in the air, leaves turning colors, crops being harvested - Fall is wonderful season full of expectation. Bring the beauty of harvest time into your home with this vibrant Pumpkin Patch Insta-Theme. Use as a scene setting for a fall festival or dance, a Halloween or harvest party, or to decorate a large wall for a Thanksgiving dinner. The Pumpkin Patch Insta-Theme, like all of our insta-themes, is perfect as a photo booth background. The completed scene as pictured consists of two backdrops. 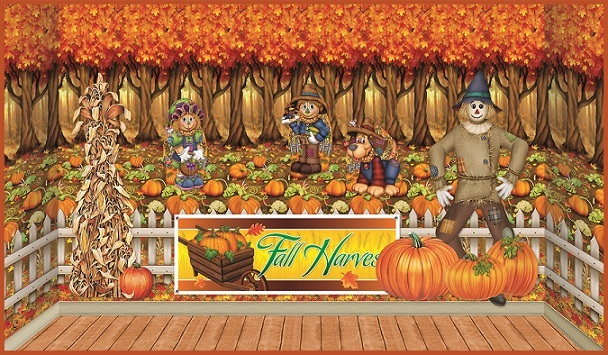 The Fall Trees Backdrop combined with the Pumpkin Patch Backdrop creates a true feeling of being in the pumpkin patch. Browse all of PartyCheap's other autumn and/or harvest decorations and remember, we have seasonal decorations decorations for Winter, Spring, and Summer as well.